I am very in trouble not to find how to solve the problem. The problem is that I want to include my app into list in dialog. The dialog is launched when I put device on cradle or dock. I have searched for a very long time. And finally I found it! The hint page is here. I appreciate the author writing it very much. I have to use intent. And the setting is following. This resolve point is I have to use both category.DESK_DOCK and category.DEFAULT together. If I use only which one of those, it can’t work. 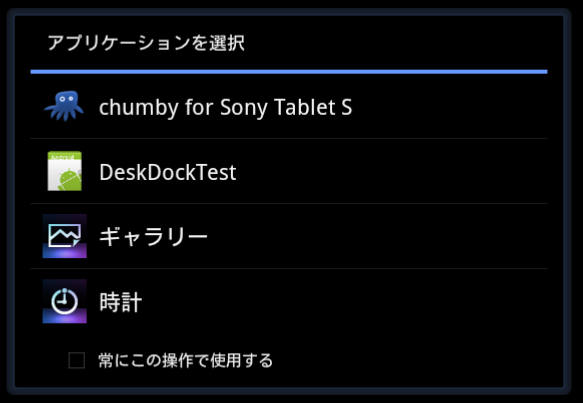 DeskDockTest app is my application. The others are default app of devices.